Opinion Forum » Is the 1950 Korea Mess Relevant to the New Korean Mess? Probably very little, beyond the differences. T he North Korean invasion of South Korea began on June 25, 1950 when North Korean troops — many of them battle-hardened veterans of Mao’s fights against Chiang Kai-shek’s Nationalists — crossed the thirty-eighth parallel to invade South Korea, initially at the Ongjin Peninsula. They met with little resistance as they took Seoul and proceeded largely unimpeded and quickly south, driving the miserably armed and led South Korean (Republic of Korea or ROK) forces before them. Five hundred or so members of the Korea Military Advisory Group (KMAG) were stationed in South Korea, many of the officers on leave elsewhere on the twenty-fifth. The invasion came as a surprise to General MacArthur, whose duties had little to do with Korea. KMAG was in any event principally a responsibility of the Department of State and General MacArthur had been advised by his chief of intelligence (G2), General Charles Willoughby, that there was no danger of invasion. The principal function of KMAG was to prevent ROK forces under ROK President Syngman Rhee from starting a war by invading north. The ROK forces were a ragged collection of poorly trained and ill equipped troops. The far better trained (although not well equipped) North Korean forces were able to augment their slim supplies of weapons, ammunition, food and other necessities with the stuff left unsecured or discarded by the ROK forces as they fled south. I wrote a lengthy article about the Korean Conflict here. It provides some useful context for the current situation, but not much. We have had ample warning. The greatest difference between now and June of 1950 insofar as Korea is concerned is that we have had plenty of warning over a period of weeks this time and before that in smaller scale over a period of years. Not even General Willoughby could have ignored such warnings and Dean Acheson probably would not have delivered a speech omitting South Korea from his list of friendly nations in the Asian region to whose defense the United States would come if attacked. By doing that not long before the 1950 conflict began, he helped Kim Il-sung to persuade his Russian patron, Joseph Stalin, that the United States would not defend the country. The Chinese intervention, not long after General MacArthur’s successful Inchon invasion on September 15, 1950, also came as a complete surprise. The Chinese had moved approximately three hundred thousand Chinese troops to, and many of them across, the Yalu River without gaining the attention of the United States. They moved through the snow at night and hid during the day. General MacArthur’s General Willoughby did not credit fragmentary reports that they were coming until shortly before they had substantially overwhelmed U.S. and ROK forces and begun to drive them south. White House press secretary Jay Carney said Friday that the administration wouldn’t be surprised if North Korea followed through on threats to launch a missile. “We’ve obviously seen the reports that North Korea may be making preparations to launch a missile. We’re monitoring this situation closely, and we would not be surprised to see them take such an action,” Carney said during a press briefing. North Korea reportedly has moved missile and launch equipment to its east coast, and the regime asked foreign governments Friday to pull their ambassadors from the country, saying it could not guarantee their safety as of April 10, Reuters reports. The North Korean government signaled war is inevitable because of the “increasing threat from the United States” and cited the joint military exercises the United States is conducting with South Korea, according to the Reuters report. Carney reiterated the United States’ call for North Korean leaders to choose peace. North Korea has now moved missiles onto launchers and there has been talk that they could technically strike the west coast of the U.S. Asked if that is accurate, Carafano tells Newsmax TV in an exclusive interview: “Absolutely. They haven’t done it but we know they have the technical capability that allows them to do that and they don’t have to reach that far. North Korea moved those missiles with full knowledge that the United States would observe the actions because “we have satellite imagery overhead covering the entire country” and “they know we’re watching.” But as for what these developments mean, Carafano admits: “I can absolutely tell you with 100 percent confidence that I have no idea what this means. We’ve seen the North Koreans bluster and do nothing, we’ve seen them bluster and do something. We’ve seen them say nothing and do something. He may be right in saying that we have seen North Korea “bluster and do something,” but I do not recall any prior situation in which bluster at threat levels approaching those at the present was followed by action beyond acceptance of welfare from foreign nations and their nongovernmental organizations (NGOs). Kim Jong Un’s efforts to consolidate power continue 15 months after formally assuming the supreme leadership of North Korea. Evidence of his personal stamp can be seen in a series of senior personnel appointments made at the recent plenary session of the Korean Workers’ Party (KWP) Central Committee held on March 31, 2013, and the 7th session of the 12th Supreme People’s Assembly (SPA), the country’s unicameral legislature, on April 1. The article does indicate that Kim Jong-il’s sister and her husband — at the head of the regency — have gained significant additional power. Pak Pong Ju was elected to the Political Bureau replacing Vice Marshal Kim Jong Gak, a member of the military faction. Pak was the Premier (Prime Minister) from September 2003 to April 2007. Pyongyang watchers view him as a major reformer in the DPRK’s political and economic life, particularly since he presided over the implementation of a number of modifications to the country’s economic policies as Premier. In addition, Pak has close political ties to Kim Jong Un’s uncle and aunt—Jang Song Thaek and his wife, Kim Kyong Hui, sister to the late Kim Jong Il. This time there has been more than ample warning — perhaps enough to confuse and/or desensitize us. Shell games provide an analogy. The shells now on the table have beneath them artillery attacks on Seoul, launches of missiles toward Japan, South Korea, Guam and possibly the United States, an electromagnetic pulse (EMP) attack on the continental United States using the satellite launched late last year or possibly another to be launched into polar orbit. North Korea may have additional shells with additional threats to put on the table. With only one shell hiding a pea, the dealer usually wins. If a pea were hidden under one and highly lethal things under each of the others, who would be likely to win? Until infirmities of getting older caught up with me, I enjoyed training horses and devoted a lot of time to it. 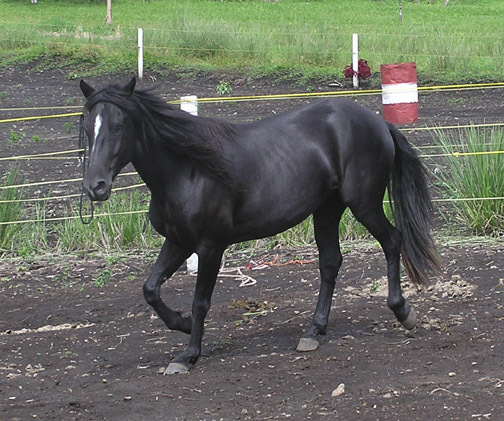 One day when I was riding our nervous young stallion, Flash, he was startled by an empty cement bag hefted by a wind gust and flying in our direction from the left. He panicked, even though the bag was at least fifty meters away (horses’ eyes are mounted at the sides, rather than fronts, of their heads and they have poor depth perception). He shied what seemed at the time to be about half way across the training area to the right, pulling my tailor muscle in the process. I calmed him with soothing sounds and strokes and then rode him back to the stable area, where I dismounted. I would have liked to have begun desensitization immediately but even walking to the car less than five meters away was quite painful. Within a few days, I was able to begin getting him accustomed to flying bags. First, I rubbed his back pleasantly with an empty feed sack. After that had ceased to bother him, I shook it in his face. It took a bit longer, but he settled down. Then I attached the sack to the end of a long flexible stick and after a while I was able to wave it in his general direction while I had him going on a lunge line in a circle around me. Then, I did the same thing with him going around in circles at liberty. The process took several weeks, but it seems to have worked. There are many differences: Flash trusted me, we don’t trust North Korea; there is no apparent reason why we should and there are many good reasons why we shouldn’t. Desensitization of Flash was gradual, with escalating provocations; as horrifying as a flying empty paper sack can be to a young horse, they are not usually fatal. Even threats of missile attack on Seoul, taken seriously, would be highly disruptive. The reality would be fatal to many living and working there. The analogy is a far-fetched, but not absolutely dismissible, explanation for the current North Korean bluster: get us and others so accustomed to repeated threats of violence that we cease to worry and don’t prepare. Then, attack. Military feints are similar: give the enemy reasons to think an attack will come at point A and/or B, and then attack at point C, left undefended. That worked well for General MacArthur in his September 15th Inchon invasion. Inchon had seemed a nearly impossible site for a successful amphibious invasion (difficult to predict thirty foot tides, mud flats on both sides of the Flying Fish Channel and an inadequate beachhead at the end) and there were sites that would have been far easier. He made feints at those and the Inchon invasion came as a big surprise to North Korean forces which had left it largely undefended. Luck was also on his side. North Korea’s threats are of deadly serious action. We should be no less serious. The Obama administration and its allies in the press also want us to believe that North Korea’s current “nuclear devices” are not a real threat because of their low explosive yield, only a few kilotons. Supposedly, North Korea after 20 years and three nuclear tests is still struggling to make a crude first generation atomic bomb. North Korea, during the successful test of its ICBM on December 12, 2012, orbited a satellite weighing 100 kilograms (about 200 pounds). One design of a Super-EMP warhead would be a modified neutron bomb, more accurately an Enhanced Radiation Warhead (ERW) because it produces not only many neutrons but also many gamma rays. As noted earlier, gamma rays cause the EMP effect. One U.S. ERW warhead (the W-82) deployed in NATO during the Cold War weighed, including its heavy casing, less than 50 kilograms. Since the EMP attack entails detonating the warhead at high-altitude, above the atmosphere, the warhead does not even need a heavy re-entry vehicle and heat shield. North Korea’s ICBM does not have to be accurate to make an EMP attack against the United States. The EMP field is so large that detonating anywhere over the U.S. would have catastrophic consequences. North Korea orbited its satellite around the Earth at an altitude of about 500 kilometers. The trajectory of North Korea’s satellite is no accident–they deliberately aimed for and achieved this orbit and altitude, as announced before their launch. An altitude of 500 kilometers would be ideal for making an EMP attack that places the field over the entire lower 48 United States. The lengthy article goes into great detail as to its reasoning and may be soundly based. I don’t know. Here is a shorter article at International Business Daily that makes essentially the same points. Both are more interesting and explain the possibilities better than do reports in the “legitimate” media. If accurate or even nearly so, the consequences could be devastating. It is not something to be ignored out of hand. We seem unprepared to prevent an EMP attack and the consequences would be calamitous. There have been official warnings. Whatever the real dangers may (or may not) be, there have been numerous reports, some from credible sources, that North Korea plans to do something very bad, very soon. The Kaesong industrial complex is a joint venture between South and North Korea located not far to the North of the DMZ. North Korea has advised South Korean workers there to leave and many have; more seem likely to leave this weekend. The North Korean factory park that is the last vestige of cooperation with the South moved closer to paralysis Saturday as nearly 100 South Korean workers went home across a border that Pyongyang has closed in the return direction. South Korean workers who left the Kaesong industrial complex just north of the heavily armed Demilitarized Zone said their companies were running out of raw materials that ordinarily would be trucked in from the South. South Korea’s Unification Ministry said one of the more than 120 companies operating at the complex shut down Saturday, the fourth to do so since North Korea barred people and cargo from entering on Wednesday. The Kaesong complex is one of North Korea’s few legitimate sources of hard currency. In addition, foreign embassies in Pyongyang have been warned to evacuate personnel before April 10th, after which North Korea will accept no responsibility for their safety. Pyongyang is thirteen hours ahead of Washington, D.C., so if something unfortunate is scheduled for the tenth in Pyongyang it could happen on the ninth, Eastern Daylight Time. (CNN) — Foreign diplomatic missions in North Korea face an ominous decision after Pyongyang said Friday it could not guarantee the safety of embassies and international organizations in the event of armed conflict. Tensions on the Korean peninsula remain in a heightened state amid new reports that North Korea has prepared missiles for launch, while South Korea has deployed naval destroyers to its coasts. The British Foreign Office said North Korea told British officials that it would not be able to guarantee the safety of diplomats in the capital if fighting breaks out. Several diplomatic missions said the North Koreans held a meeting Friday for ambassadors in which they asked whether anyone needed assistance in evacuating their personnel. On the other hand, this article suggests that the embassy warnings are just part of the North Korean bluster. Perhaps they are, but there seem to be no comparable bases for treating the Kaesong situation as mere bluster. The call to evacuate foreign embassies appeared to be the latest tactic by North Korea to dial up the rhetoric and win concessions from the U.S. and South Korea. Pyongyang has already threatened a nuclear strike against the U.S., declared it has scrapped the Korean War armistice, vowed to restart a plutonium reactor, and blocked South Koreans from entering the jointly run industrial complex in Kaesong. In North Korea today, thousands took part in rallies against the U.S. and South Korea. Broadcaster KRT aired images of students donning military uniforms, practicing their shooting while speaking against “the warmongers in the White House and Pentagon,” according to the Associated Press. State television also showed workers from the Pyongyang 326 Cable Factory supporting their country’s nuclear program. Notions that a lunatic Kim Jong-un is off on a wild frolic of his own demented and juvenile design strike me as quite wrong; he is probably tightly controlled by a regency. I concur with this statement by the Heritage Foundation’s Dr. Carafano: ”I can absolutely tell you with 100 percent confidence that I have no idea what this means.” I can only hope — with little if any reason for doing so — that our Government’s foreign affairs and military experts have solid and accurate information to rely upon for what they have been doing and for their contingency planning. I fear, however, that just as our Middle East and other foreign policies, actions and inactions have been driven far more by ideology — and President Obama’s supreme but unwarranted confidence in his own abilities — than by reality, the same is happening and will continue to happen as the present Korean situation unfolds.